Bee Pollen – Nature’s Most Perfect Food! In its original state, pollen is a fine powder composed of thousands of microscopic particles which are discharged from the anther of a flower, and is the male element of the plant which fertilizes like plants. There are two kinds of pollen: anemophile (“friend of the wind”), and entomophile (“friend of the insect”). The former, which causes allergic reactions such as hay fever, is dispersed by the air. The latter, which is the subject of this information, is gathered by the honeybee, whose travels from flower to flower make possible the reproduction of more than 80% of the world’s grains, fruits, vegetables and legumes. When pollen is collected for human consumption, “pollen traps” are placed on the hive. These traps remove the pollen granules from the leg of the bee and allow it to fall down into a tray for removal by the beekeeper. The bee pollen is then sifted to remove any foreign matter that is frequently found in the hive, such as, wings and legs. After removing the non pollen particles by fan, the pollen is dried and frozen and ready for resale. A supply of bee pollen is like holding a whole health food store in the palm of your hand. With the addition of roughage and water, the human body can survive on honeybee pollen alone. This is because it is the only food which contains, in perfect balance, all 22 known essential nutritional elements which humans require to achieve and maintain optimum vitality. Refer to the bottom of this page for an analysis of the average bee pollen content. Bee pollen may be eaten by the teaspoonful as a food supplement, 1-2 teaspoonfuls daily. Stir it into yogurt, honey, or applesauce. Sprinkle it on your salad or cereal or take it straight with water or fruit juice. Do not heat the pollen, however, since doing so will destroy many of the nutrients it contains. If you are a new pollen consumer, start off with small doses (4-6 pellets) to gauge how your body’s system will accept pollen. Doing so will help minimize a reaction to the natural substance. Like any food, there is a small chance of an allergic reaction to the pollen, if there is no reaction within 5 minutes, continue with larger doses. In some cases, consuming bee pollen collected from your immediate area has alleviated allergy symptoms. Pollen will vary from region to region because the blooms vary. In treating allergies, pollen from your immediate area will be more beneficial than bee pollen from another region. In many cases it is not possible to get pollen from your immediate region, in which case bee pollen from other regions is still beneficial, especially for the protein and the nutritional value. It is recommended that you store your pollen in a dark, cool place, preferably the refrigerator or freezer. Pollen is a “food” that can spoil after a period of time at room temperature. Freezing the pollen will keep it fresh and at full strength for up to 2 years. 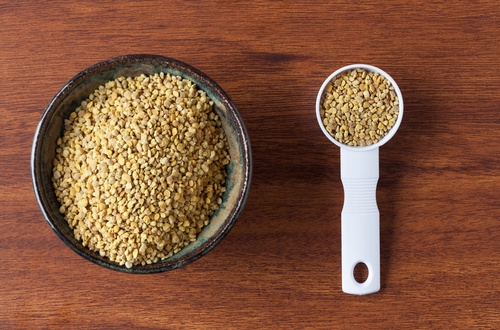 Each ounce (2 tablespoons) of bee pollen contains just 28 calories. 1 pound of bee pollen contains approximately 31 tablespoons. I want to try it, its taste seems to be delicious and gorgeous but when we talk about healthy benefits off pollen i think that some studies says there isn’t enough evidence to consider bee pollen to be some magical healing elixir.